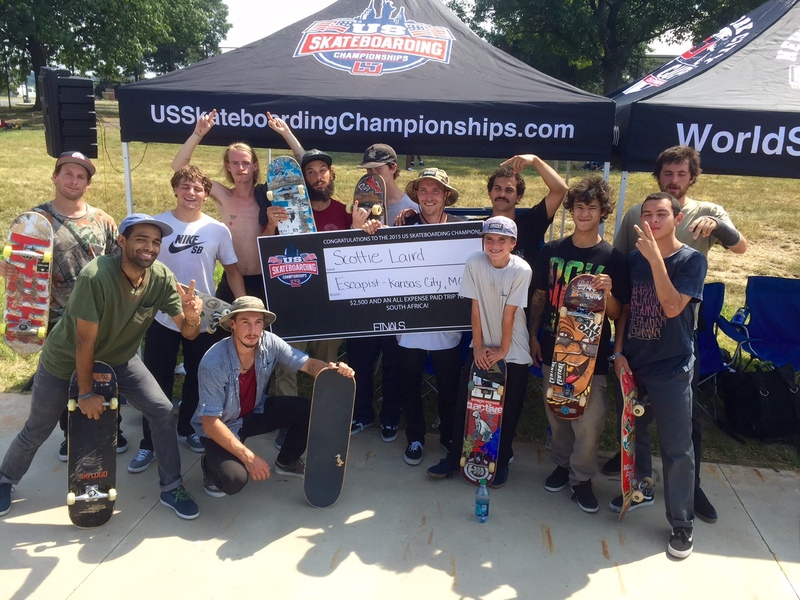 Regional Qualifying Contests Held at Nation’s Top Independent Skate Shops Over the Summer; Winners Competed in Finals Aug. 29 in Washington D.C.
Sacramento, CA– (September 02, 2015) – World Skateboarding Grand Prix (WSGP) — the leading global skateboarding events management company — announced today that Scotty Laird won the first-ever U.S. Skateboarding Championships held in Washington D.C. on Saturday, August 29. Laird qualified for the finals after winning the Kansas City, Missouri regional qualifiers hosted by Escapist Skateboarding. Yoshi Tanenbaum, who qualified at Pitcrew in Maryland, placed second and also won the Best Trick contest. Finalists earned spots by placing in the top three in regional competitions held in nine cities over the summer. The first place winners received paid trips to the finals. Laird’s win earns him a trip to compete in the Skateboarding World Championships at the Kimberley Diamond Cup in South Africa Oct. 7-10. The qualifying contests were held at nine of the leading independent skate retailers across the country, including: Pitcrew (Frederick, Maryland), Uprise (Chicago), Shrunkenhead Skateboards (Portland), Escapist Skateboarding (Kansas City, Missouri), KCDC (New York), Skate Works & One Way (San Jose and Santa Maria, California), 3rd Lair (Minneapolis), Hazard County (Atlanta) and Rhythm Skate Shop (Dallas). The format for the finals was a single elimination, head-to-head bracket-style format, widely hailed as the most innovative and exciting format for contests today. The U.S. Skateboarding Championships are sanctioned by the World Skateboarding Federation, a governing body for skateboarding. World Skateboarding Grand Prix is the leading international skateboarding events management company. WSGP hosts world-class skateboarding events with a commitment to help stimulate local economies through tourism while supporting youth development, especially those in underserved or imporished communities. WSGP events including the Rider Cup Team Championships, the Turkish Skateboarding Championships, the U.S. Skateboarding Championships, and the World Skateboarding Championships at the Kimberley Diamond Cup. For the latest news and information on the 2015 Skateboarding World Championships at the Kimberley Diamond Cup and other upcoming World Skateboarding Grand Prix events, visit www.worldskateboarding.com. To view WSGP’s corporate site, go to www.worldskateboardinginternational.com.